The Genesis.XA is designed to be a "load and go" brush that can paint fine detail. The single action trigger works off the philosophy of a refillable spray can, but with controllable air pressure. 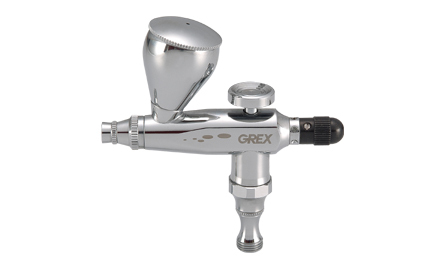 This airbrush is perfect for repetitive work, or work that does not require constant variations in paint volume. Ideal for small objects that need solid painting. - Cutting edge design specifically for precise control of fine detailed work. - Adjustable knob for precise paint volume control. - Solvent proof Teflon seals allows use of any medium. - Internally mixed for improved atomization. - Larger diameter nozzle threads for improved centering & stronger tightening. - Convenient to clean design. - Short passageway from cup to nozzle for responsive feel. - Accept oils, gouaches, urethanes, enamels, lacquers, acrylics, dyes, inks, more. - Adaptable with major brands of airbrush jars and/or color cups.